Yes you are right, I am missing my yoga retreat breakfast of Kitchari, so I have just made some, It is easy. Kitchari is a delicious and nutritive whole food from India that is known for its properties to detox the body and balance the three doshas (constitutions): Vata, Pitta and Kapha. This ayurvedic dish is used by yogis who want to cleanse the body and soul in a gentle manner, kitchari supply enough nutrients while removes toxins stored in bodily tissues and restores systemic balance. Ayurveda believes that all healing begins with the digestive tract, and kitchari can give it a much-needed rest from constantly processing different foods while providing essential nutrients. Its mixture of spices is believed to kindle the digestive fire, the Ayurvedic description for your innate digestive power, which can be weakened by poor food combinations. Kitchari is made with mung beans or lentils, basmati rice or barley, seasonal vegetables, ghee, and spices. Add whatever seasonal vegetables you have on hand to complete the dish. Consider zuchini, burdock root, carrots, kale, spinach, sweet potato. The key is to use what’s available locally because Ayurveda is linked to the natural transition of the seasons. Go light on the salt in this recipe, allowing the natural flavours of vegetable stock. 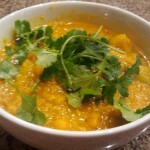 Kitchari tastes like a cross between a creamy rice cereal and a light dal, or lentil soup. If it is a cold, blustery day or you are feeling under the weather, a steaming bowl of this classic Indian comfort food can both warm up your bones and restore sagging energy. In a medium saucepan warm the ghee, saute the onion, garlic and ginger, add the kitchari spice mixture and sauté for one-two minutes. Add rice and mung beans and sauté for another couple of minutes. Add 6 cups of water and bring to a boil. When kitchari has come to a boil reduce the heat to medium-low, cover an cook until it is tender, approximate 30-45 minutes. Add vegetables to your kitchari: the longer cooking such as carrots halfway through the coking and vegetables that cook faster such as leafy greens near the end. Add more water if needed.